The Gift of a Smile is irreplacable. She cried tears as her mother's friend sat in her apartment and handed her a thing of dental floss and listerine. She thought it was funny making fun of someone in their own house but she crushed the girls heart just from her statement, "Your breath stinks." The young girl at 24 had already been bullied majority of her life and because of her smile she also suffered low self-esteem and to make matters worse, her mother's friend was adding to her pain of not loving herself. She knew a smile was everything and for someone to make fun of her made her want to cry instead so she decided to do something about it and not let the old lady who was her mom's friend bullying get to her. Why is good dental hygeine important ? Many adults experience significant dental problems that could be prevented through basic oral hygiene practices, like regular dentist appointments. For example, in 2009 alone, CDC data indicated that only 62 percent of researched adults visited the dentist. To maintain optimal oral health, adults should brush their teeth at least twice a day, preferably after each meal and before going to bed. Flossing is also an essential part of an adult’s daily oral hygiene regimen. Regular brushing and flossing can prevent unpleasant and embarrassing conditions, such as plaque and bad odor. However, over-brushing or flossing may result in mouth bruises and bleeding, which can lead to infections. Adults should visit their dentist regularly for routine check-ups or before purchasing over-the-counter medication. 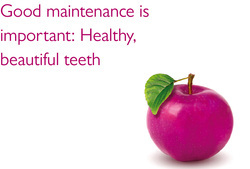 Oral Hygiene Facts Poor oral hygiene can increase your chances of developing heart disease. Professional teeth cleanings will reduce the bacteria that cause inflammation and eventually lead to heart disease (Veterans General Hospital in Taipei). A major cause of tooth loss in children is cavities; while periodontal (gum) disease is the leading cause of tooth loss in adults. Eating healthy snacks such as celery, carrots or apples helps clear away food loosely trapped in-between teeth. The Smile Train's goal is to find people who are having problems with their dental hygeine. We will find innovative ways to raise awareness and improve the lives of those who want a better and more confident smile. You will feel good and look good because you deserve to. More Information. Be a more positive you.